Three in ten Australians have thrown away clothing after wearing it just once, a new study from YouGov has revealed. 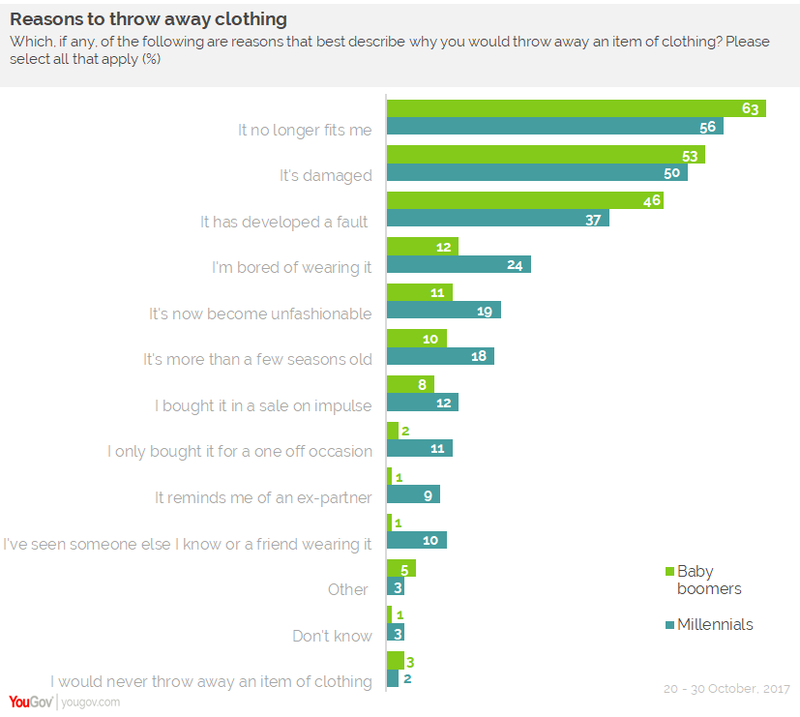 An additional four in ten admitted to throwing unwanted clothing in the rubbish, while 38% of millennials have bought more than half of their entire wardrobe in the last year. The fast fashion industry has come to dominate the clothing world, with accessible, cheap fashion lining the stores and constant sales encouraging the naive shopper to buy more – and more often. We are confronted with so much affordable fashion that we are buying more clothes than we can wear – between 2000 and 2014, the amount of garments purchased by the average person increased by 60%. Despite our tendency to shop, many people don’t consider the impact of their actions on both the people making the clothes and the environment. In recent years, critics have attempted to highlight the need for ethical, sustainable fashion. The unacceptable conditions of sweatshops have been exposed, with staff forced to work in cramped spaces for extremely long hours and very little pay. Environmentalists have shown the harsh effects of the extensive water usage and chemical waste that the production process causes. More and more brands have begun looking at alternative ways to make clothing, from using organic, deadstock cotton and eco-packaging like Los Angeles brand Christy Dawn, to paying staff a living wage and maintaining a decent, spacious workspace like West African brand Yevu. Gammon adds that the issue must be tackled head-on in order to see real results. Looking at a garment’s fabric content and country of manufacture is an important step in the right direction. Finding sustainable ways to dispose of clothing that is damaged or no longer fits is another way you can help. Instead of throwing clothing in the bin, donate it to a charity, give it to a friend or salvage the material for sewing and other creative ventures. WORLD has opened its first stand-alone store in Christchurch since the 2011 earthquake. Just a short walk from where the original store stood, the new building stocks both Mens and Womens collections as well as the full selection of WORLD beauty products. The eclectic store is known for its range of quality product, from high fashion clothing and luxe skincare to leather goods and quirky accessories. Check out the images of the new store below. WORLD Christchurch is located at 11/181 High Street, Corner High & Tuam Streets.